dd a modern twist to your vehicle’s interior with our sleek Modernistic seat covers. The sharp lines and angles in this design command attention, and the pop of color will make sure all eyes are on you. Our high quality fabric is backed by 3mm of foam padding to disperse heat and keep you cool and comfortable, even in the hottest temperatures. Sustains your automobile interior upholstery. Adjustable straps helps installation, removal and reattachment One piece style front bucket seat covers, can be used with both non removable and removable headrest. Special stitching technique enables side airbag compatibility – officially tested! 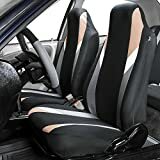 Durable stretchy fabric with opening pocket for storage Engineered to accommodate traditional and heated seats Semi-customized to fit most vehicles. Material is breathable. Machine wash and air dry. This half set includes seat covers for two (2) bucket seats. Concealed Velcro opening and adjustable straps helps installation, removal and reattachment. Special stitching technique enables side airbag compatibility – officially tested! dd a modern twist to your vehicle’s interior with our sleek Modernistic seat covers. The sharp lines and angles in this design command attention, and the pop of color will make sure all eyes are on you. Our high quality fabric is backed by 3mm of foam padding to disperse heat and keep you cool and comfortable, even in the hottest temperatures. • Sustains your automobile interior upholstery. • Adjustable straps helps installation, removal and reattachment • One piece style front bucket seat covers, can be used with both non removable and removable headrest. • Special stitching technique enables side airbag compatibility – officially tested! • Durable stretchy fabric with opening pocket for storage • Engineered to accommodate traditional and heated seats • Semi-customized to fit most vehicles. • Material is breathable. Machine wash and air dry. This half set includes seat covers for two (2) bucket seats.